artisticartifacts.com: Artistic Artifacts a Top Shop! Artistic Artifacts a Top Shop! Quilt Sampler Issue Still Available! 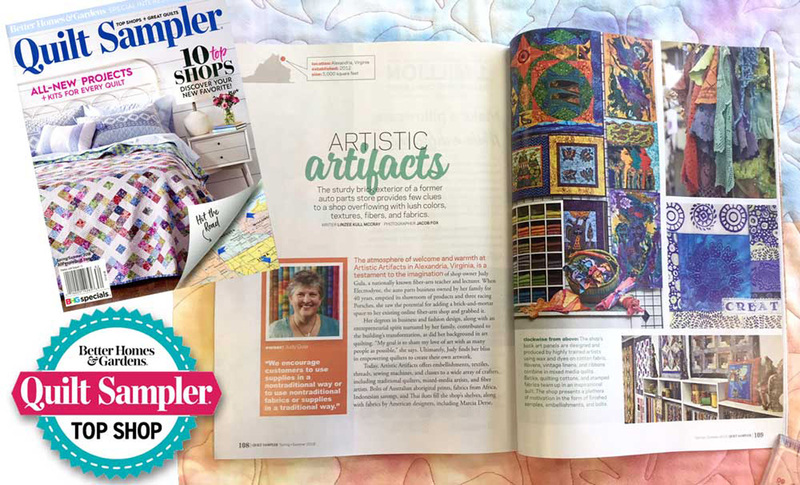 Artistic Artifacts was one of 10 shops from across North America featured in the Spring/Summer 2018 issue of Quilt Sampler® magazine! Published by Better Homes & Gardens, the issue is still available from us — purchase your issue to get lost in the inspiring pages featuring these destination quilt shops from across the U.S. In addition to the interviews and inspiring photographs, instructions to comple quilt projects are also included. Quilt Sampler asks each quilt shop to design and sew an original, magazine-exclusive quilt project with complete instructions to include. The Artistic Artifacts quilt project is pictured here (photograph used with permission from Quilt Sampler® magazine; ©2018 Meredith Corporation; all rights reserved). Each shop also creates a kit for easy completion of their project, and we did the same. In fact, we created multiplecolorways for this floral batik panel quilt — purchase your favorite colors of the Artistic Artifacts Quilt Sampler kit! 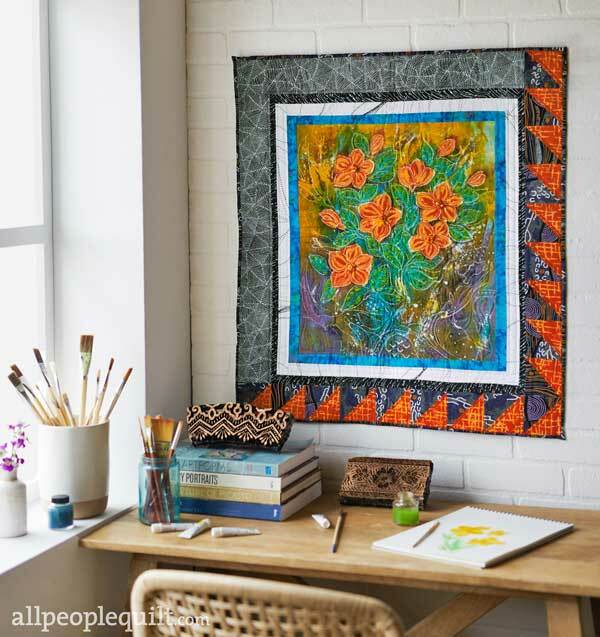 This original design by Artistic Artifacts owner Judy Vincentz Gula, author of Colorful Batik Panel Quilts: 28 Quilting and Embellishing Inspirations from Around the World, uses a Hari Agung batik panel as the focal point. Our kits include the featured floral batik panel, coordinating Australian Aborigine Designed fabrics and our own Batik Tambal Exclusive Batiks to make the illustrated quilt top, plus beads, Silamide beading thread and a needle so you can embellish! We have also created color-coordinated thread kits for you: selections of WonderFil Specialty Thread to sew and quilt! Our finished quilt is 27 1/2 inches by 30 1/2 inches. Artistic Artifacts (and the other nine chosen shops) were extensively photographed and interviewed by a team from Quilt Sampler for the multipage profile that appears in the issue. Our interview and photography session was in September 2017 and the Quilt Sampler crew could not have been nicer to us! Pictured here, photographer Jacob Fox focuses on quilts created using our hand-drawn batik panels. The Quilt Sampler team created beautiful, colorful vignettes to showcase both the shop and our wide range of products to our best advantage. It was an exciting day — and very hard to keep the secret until we able to share the news! Quilt Sampler, published twice a year, has been profiling North America’s top quilt shops since 1995. Competition to be included in Quilt Sampler is high — nearly 3,000 quilt shops were eligible to apply for this year’s honor! Artistic Artifacts owner Judy Gula, like all other shop owners, submitted a detailed application on the store history, business promotions, charitable work, teaching schedules, and design philosophies. Spearheaded by the American Patchwork & Quilting® staff, a panel of quilt experts reviews the applications each year to select the shops that will be featured. The art of quilting has changed dramatically since the days of quilting bees in church basements, and quilting is experiencing a major renaissance. A Quilting Consumer Insights study completed by American Patchwork & Quilting magazine reports that the U.S. quilting market is composed of 4.2 million avid quilters. Further research shows that readers of American Patchwork & Quilting spend an average of $1,165 per year on quilting supplies and complete nearly 11 projects per year. 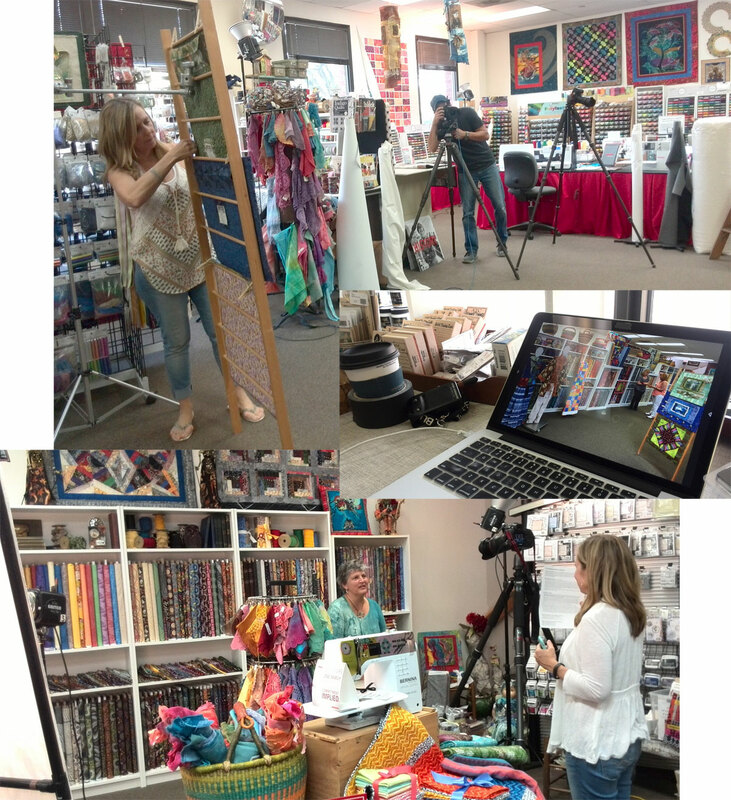 Below, Quilt Sampler crew Linzee Kull McCray and Jacob Fox at work photographing Artistic Artifacts and interviewing owner Judy Gula.